A few weeks ago my hometown of Newburyport, MA held its first annual Literary Festival. 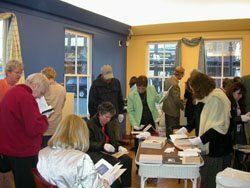 I was asked early in the planning stages to work on a book art-related event and organized a one-week exhibition at the Laura Coombs Hills Gallery of the Newburyport Art Association for members of Boston Book Arts. I viewed this an opportunity to reach a new audience and felt that highlighting the book experience of the artist's book was in keeping with the festival. The title was The Reading Room and the exhibit was set up as such. In the prospectus it was explained that artists had to agree that all work submitted was available to be handled with white gloves. Five sculptural pieces were displayed on pedestals. The rest of the work was laid out on tables. The room was set up with twelve chairs, a few stools, three table-height tables and four smaller lower tables. 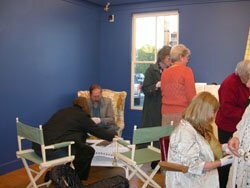 The art association has what most find an unusual look with different colored walls in bright rich colors. 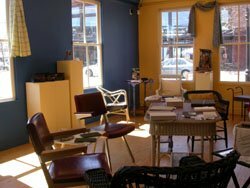 The Laura Coombs Hills Gallery has two blue walls and one yellow one, a wood floor, and a brick wall by the ramp entrance which we did not use. To focus attention on the books, we left the walls bare except for a sign, an empty picture frame, and draped fabric as swags on two windows. We wanted to room to look cozy and inviting and I think we succeeded. I think one of the things that got me thinking in this way was a comment made by Steve Hall, the director of the Fine Art Center at Regis College, at one of our planning meetings regarding the Spirit Book exhibit I had there last fall. As we talked about the installation, he said something to the effect of, No offense, but I don't care about the work but the viewers' experience of the work. With a background in theater production, he saw the exhibition as an experience rather than a presentation of work. Without thinking consciously about it, I think that idea was in my mind as I thought about The Reading Room. And it is how I will be thinking about exhibitions from now on. The exhibition was a great success both in terms of attendance and in response. I think people did truly experience rather than view the books. The feeling in the room was amazing. During the weekend there were 10 to 15 people in the room most of the time. At the reception, it was packed. The wonderful thing was that people were really focused on the work. We had a strict no food or drink policy, for obvious reasons, and had the refreshments in the main gallery at the reception. There were people who came when it started at 7 and left when it ended at 9 and never even went for refreshments. I would say that most people who came to see the exhibit stayed at least a half an hour and many stayed between one and two hours. We had someone from Boston Book Arts in the gallery at all times to make sure the work was safe and to answer questions and I think everyone was as impressed as I was with the response. Marcia Ciro, one of BBA's founders, and I had a discussion about why it worked so well. 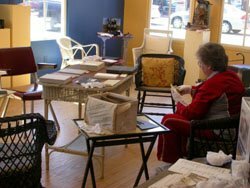 She said, and I agree, that there is something very different about the experience of sitting and viewing a book compared to standing and looking at it even if you are allowed to touch. When you are standing, you are part of the public space and your experience of the book is one which takes place in the larger world. When you are sitting with a book, you are in a private space and can have an intimate personal encounter. I realize that there are risks involved with exhibiting books in this way and that the format would not work in many venues but if the circumstances allow, I recommend it.